My focus this week was to highlight texture, both physical texture through my beads, and visual texture through color and contrast. 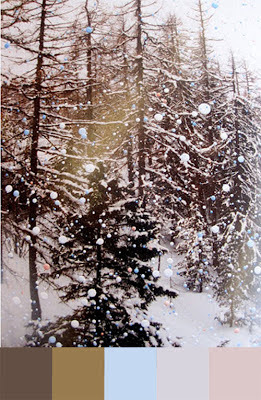 It seemed only natural to choose a Gerhard Richter painting as my inspiration point, so I turned to this wintry forest scene, one of my favorites. I already had pearls, crystals, daggers, wood and glass beads in the painting’s color palette. 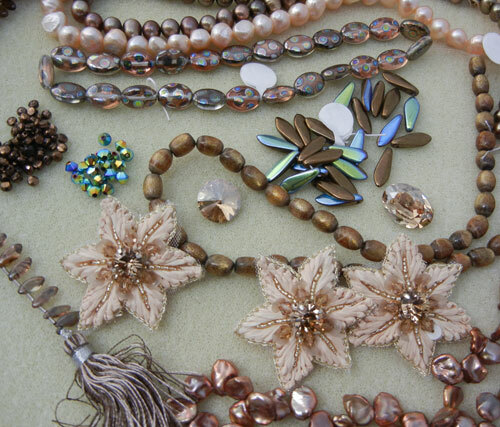 A visit to a ribbon store produced the rosy cream-colored crystal and fiber shapes, which I discovered nestled in a display case with a collection of vintage buttons. The store owner explained that they were intended to be used as appliques to upcycle jean jackets. I thought their six sides suggested snowflakes and knew I had found the perfect answer to my search for some softer texture. My snowflakes were whisper light and would need some reinforcement before I could use them in my focal. In the photo below, the top snowflake shows the original back view of the appliques, two of which I backed in Lacy’s Stiff Stuff and upholstery-weight ultrasuede. 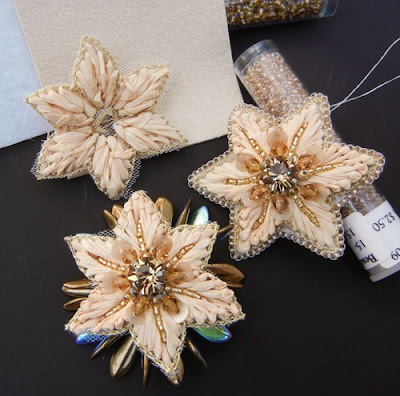 I stitched the third snowflake to a starburst shape constructed with the daggers and right-angle weave. A rivoli in the same shade as the snowflakes’ crystals connects the focal elements, which I hung from two strands of pearls in the painting’s darkest and lightest browns. It was so much fun working with texture. Up next week: Proportion! What a great find those flower/snowflakes were, and I love what you did with them! This is a delicate and elegant necklace. Beautiful! Beautiful! Really did a great job playing with texture. I love all of the varied surfaces - soft fabric, the lustre of pearls, matte and shiny beads, and the spiky daggers behind your central focal is just inspired. Love to see how others use paintings for inspiration. Karin - that is absolutely stunning! How clever to find those snowflakes, and back them with Lacey's - very inventive and creative! Nice job! So so Beautiful and Creative! You had quite a vision with this piece. It all came together so perfectly. I just love what you did with the snowflakes. There is no doubt in my mind that the soft fiber snowflake shapes that you so cleverly embellished are now stealing the show on this fabulous piece you created. Well done! Your necklace is gorgeous! 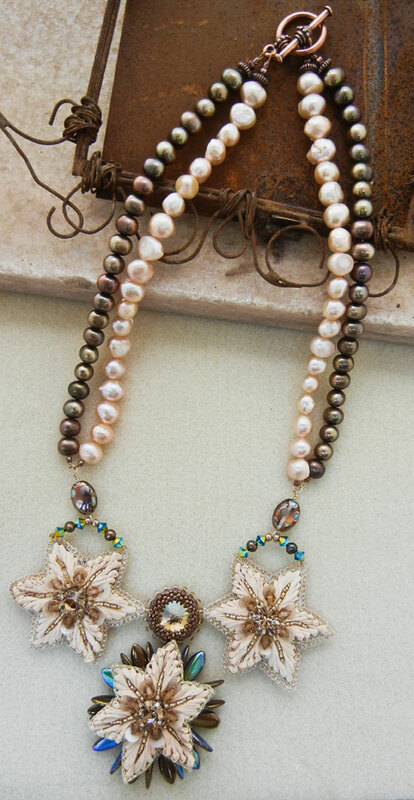 I love how you embellished the fiber snowflakes and used them with the pearls.